A traveling call against Akeem Johnson with 1.2 seconds left doomed St. Francis as they fell to LIU, 81-78 following a go-ahead layup by Julian Boyd for the Blackbirds. Forward Jamal Olasewere scored a career-high 32 points, including a perfect 11-for-11 from the field while Boyd posted his second-consecutive double-double with 20 points and 10 rebounds. St. Francis (13-12, 10-4 in the NEC) led at halftime 43-41, but LIU (19-7, 13-1) kicked it into second gear in the second half, going on a 13-3 run that gave the Blackbirds a 65-57 lead. The Terriers, however, would not be intimidated by the top-ranked team in the NEC as Travis Nichols powered St. Francis on a 13-4 run to give them back the lead. On the run, Nichols scored 10 of his 12 points. With the game tied and just 44 seconds left, Olasewere fouled out trying to block a shot by Johnson. Johnson, however, was only able to knock in one of his two free throw attempts and on the following posession, LIU permanently took the lead when Boyd hit a jump shot with 18 seconds left. 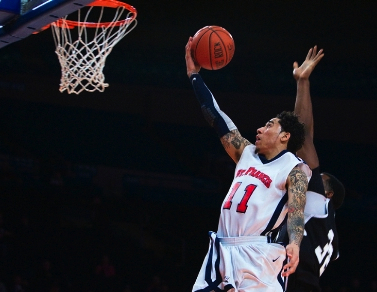 St. Francis continued their upset bid, but Johnson was called for traveling while driving to the basket in the final second of the game and the Terriers were forced to foul LIU. Senior Stefan Perunicic also made his presence felt, knocking down a pair of three pointers and recovering four rebounds. Johnson had another monster game for St. Francis, narrowly missing out on a double-double with 23 points and 9 rebounds. St. Francis punished LIU for their mistakes, outscoring the Blackbirds 22-12 off of turnovers as well as a strong performance from their bench that accumulated 25 points, but LIU shot 57.1-percent from the field and blocked five Terrier shots. For the game, St. Francis shot 45.6-percent from the field. LIU also dominated the free-throw line. The Blackbirds, who are second in the nation with 28.1 free throw attempts per game, had 30 free throw attempts while St. Francis was held to just 11. LIU also won their 22nd consecutive home game, the fourth-longest streak in the nation. 0:01 – Akeem Johnson is called for a travel with one second left in the game. LIU leads 79-78. 0:15 – Akeem Johnson hits one of two free throws then Julian Boyd comes down and makes a jumper to give the Blackbirds the lead, 79-78. 0:44 – Jamal Olasewere connects on the hard layup with the foul and ties the game at 77 apiece. 0:58 – Travis Nichols scores again and St. Francis is winning 77-74. 1:42 – During the timeout, the Terriers hold onto a slim two-point lead, 75-73. 3:40 – The Blackbirds call a full timeout as St. Francis is on an 8-0 run and have tied the game at 70 all. 4:44 – Akeem Johnson converts the conventional three-point play as the Terriers trail 70-68. 6:00 – Travis Nichols hits from downtown as the Terriers trail 70-65. 7:22 – At the official timeout, St. Francis trails 69-62 following the floater by Justin Newton. 8:30 – Perunicic drains a three to cut the deficit to five. SFC trails 65-60. 9:33 – Michael Culpo sinks the free throw and the bucket while LIU is on an 11-3 run. They lead 63-57. 11:40 – Jamal Olasewere gives the Blackbirds the lead with a thunderous slam, 56- 54. 13:10 – Brandon Thompson ties the game at 52 apiece after hitting a three-pointer. 15:26 – At the official timeout, the Terriers still hold the lead 52-49. 17:50 – C.J. Garner scores on a flashy drive as St. Francis holds onto a 47-43 lead. St. Francis Terriers hold a close two-point lead at the half against the LIU Blackbirds, 43- 41 thanks to their 16 points off 11 LIU turnovers. Akeem Johnson is the leading scorer at the half with 17 points, shooting 7-9 from the field and he made all three of his free throws. He also has three of the Terriers seven steals in the game. Jamal Olasewere of the Blackbirds has a game-high 23 points on 8-8 shooting from the field and 6-7 from the charity stripe in just 13 minutes of play. Despite losing the game, LIU is shooting a spectacular 66.7-percent from the field opposed to 50-percent for St. Francis. The Blackbirds have also out-rebounded the Terriers in the game 19-11. 1:50 – Jamal Olasewere hits a three-pointer to give LIU the lead, 38-37. 4:38 – The Terriers are currently on a 13-3 run and hold a seven point lead. 5:00 – St. Francis leads 35-30 following the layup by Travis Nichols. 7:00 – At the official timeout, the Terriers lead 29-27 awaiting two free throws by LIU. 8:50 – Boyd throws down an alley-oop as the Blackbirds lead 27-24. 10:40 – Julian Boyd sinks a three-pointer for LIU to give them the lead 23-22. 12:10 – Jalen Cannon puts in a nice put back layup off a miss to give St. Francis a 20-18 lead. 13:30 – Akeem Johnson puts St. Francis on a 12-4 run with a nice driving layup. SFC is up 16-14. 15:31 – Akeem Johnson hits both free throws and the Terriers trail by only one point, 10-9.